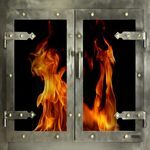 The best of the best, our steel door line offers everything you could ever want in your fireplace door. Our finishes are unmatched and we strive to bring new designs to the table. Our steel doors are functional, beautiful and efficient. The Ovation is an elegant, standard size glass door. PW's most popular door provides many styles to choose from depending on your taste. Available in our full range of finishes. 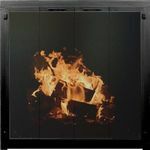 Our highest quality offering for masonry wood burning fireplaces. The Revelation can be built in a rectangular, arch or true full arch door design. The only door from Portland Willamette available with a true arch design. This door is available in 24 of our beautiful finishes. The true breaker of stereotypes! This fusion of Portland Willamette and Ironhaus styles has produced one of our favorite doors. Center mounted handles with strap hinges and rivets make this door customizable to your own design. Available in 13 powder finishes and 4 custom finishes. The Elite II is a stylish, rectangular custom size glass door manufactured using laser cut steel. This sleek, minimal frame glass door is individually designed to your exact specifications. 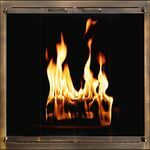 The Elite II can be used on factory built or masonry fireplaces. 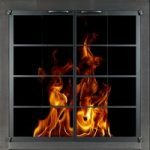 The Broadway is a stylish, modern glass enclosure designed to be used on masonry fireplaces. The back frame and the doors are fully customizable. Frame is available in 13 powder finishes and the doors are available in all 24 finishes. The Newport is a rectangular custom size door manufactured to your exact specifications. The sturdy steel frame and doors have precision welded corners. 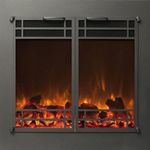 The Newport wire-cloth door can be used on either masonry or factory built fireplaces. This door is available in all 14 of our Standard Finish Options. 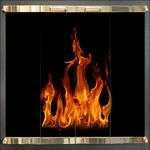 Magnetic safety fireplace faces for direct vent gas fireplaces, electric fireplaces & linear fireplaces. 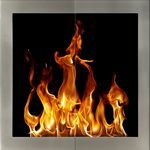 Available in many combinations to fit your fireplaces application. Made from steel with glass or mesh options for your doors. This door comes in all of our available finishes.